Learn more about Related Items Settings! Auto-generated: Related Items will be generated automatically by our engine based on similarities (e.g. product type, attributes, collections, tags) and user behaviors. Cross-Sell: Related Items will only include the items that are flagged as Cross-Sell on Upsell / Cross-Sell settings page (we'll get there in a bit). Cross-Sell Then Auto-generated: Related Items will consist of the items flagged as Cross-sell, followed by LimeSpot-generated related items. 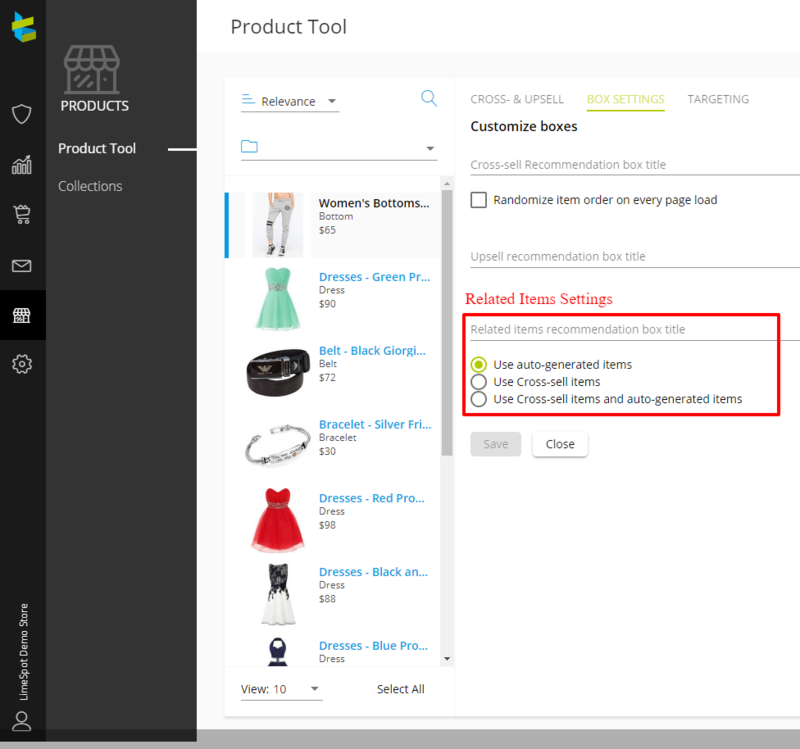 You can access the Related Items Settings in your LimeSpot Personalizer admin panel > Products > Product Tool > Pick the product you would like to edit > Box Settings tab. NOTE: If you choose options 2 or 3 from the Related Items options above, make sure to follow the steps related to Cross-sell items settings. You can assign a custom title to the Related Items recommendation box. If you leave it blank, the default title for that item's related item recommendation box will be the one that you choose in the Box Settings page (Personalizer > Set up > Customize). NOTE: If you have the Cross-sell recommendation box active on your product and/or cart pages, we suggest that you do not select this option because it will show two identical recommendation boxes on those pages. If you would like to read more about our Upsell and Cross-sell settings, follow this link.